Exhausted from the previous day we overslept, and then it took us ages to do some urgent stuff online, the WiFi was soooo slow. We left the hotel late, and tried to get some cash from various ATMs in big hotels, that we were told would work. None of them did. Also, the gas stations in Tashkent, if open at all, have no diesel. So we headed out of town, to drive 390 km to the border in Fergana that the border police in Dasoguz had indicated us as the best one in the area. Initially we drove normally, avoiding potholes and Daewoo Matiz’ that don’t know where to go. But as also yesterday, the longer we drove, the longer those 390 km seemed to become. Two hours out of Tashkent we filled one tank of diesel into the car, we should have made it to the border with it. But consumption in Uzbekistan goes up because you have to constantly slow down or stop, for a police checkpoint, crazy locals that probably never got a driving license, crossroads with no signs, potholes or stretches of unpaved road. Also, the rules on the roads here seem to be a bit different. People do drive on the right lane as in continental Europe, but within that lane they stick to the left side. If you want to overtake, you have to do it on the right, or on the opposite lane. But, to make things even more complicated, some drivers use flash lights when they race towards a slower vehicle, that then suddenly pulls over completely or partially to the right in many cases, but not in all. Given this many options, it is quite an undertaking to advance on these roads. The further we drove, the more it became clear that we would arrive late, and the faster we went. One hassle for late exit at an ex-Soviet border was enough for this month. As the tank got empty again, we needed to find a gas station. Finally, one had diesel, but didn’t want to take USD. We had to beg the guy to get a full tank. After that point it was a race against time. In every village we got lost, and our car seems to have a stealth magnet for vehicles on soviet roads. The moment we approach they put themselves in front of us, when we overtake them they head towards us. I’ve driven a lot and in many countries, but I never felt so often that I had to hope the car in front of me does no sudden mistake, to pray no kid, cow or donkey spontaneously decides to cross the road. At 100-150 km/h we raced towards the border, and we reached it at 17:17 finally. But, surprise! The border is closed to foreigners. We don’t understand how the soldiers at the entry border could not know this. Nothing to do, but to drive to the next one, in Osh. According to the soldiers 70km further east and open until 19:00. So back into the car, next level of this racing game. We got back to the same border 20 mins later as we got lost in town. A taxi driver didn’t know the road, but suddenly a white Daewoo sedan with some friendly and English speaking guys stopped and led us towards the “highway to Andijon”, the last Uzbek town before Kirgiz Osh. The more we drove, the clearer it became that we wouldn’t make it. I was already calculating the USD cash we have left, how much would go into straf or bribes if we leave again one day over deadline. But we had to take the chance and try this border. 140 km later at 19:12 we reached it. The gates we closed, but quite a crowed was waiting in front of them. We showed the soldiers our passports and 3 day transit visas with the entry stamp. They called someone on their walkie talkie, and suddenly the gate opened and we drove up to the customs terminal. The soldiers there were in a very good mood at the end of their day, we filled all papers joking with them, checked the car, even found an insurance certificate we got suddenly asked for without expecting it. And 40 mins later we left Uzbekistan. No straf, no hassles. Sometimes you really need to give things that seem impossible a chance. On the other side, we got all Kyrgyz formalities done in 20 mins. No visa needed, quick car check, more to satisfy the curiosity of the soldiers about the Range Rover. “Welcome to Kyrgyzstan!” The last gate was closed, we waited but there was no soldier to open it. So we opened it ourselves and left the country, driving into Osh. Everything is different here. Livelier, shops open until late, and many of them. All kinds of cars drive on the roads, more like in Georgia then in the last countries. Asian faces stared at us, but smiling, not grim like in Uzbekistan or Turkmenistan. 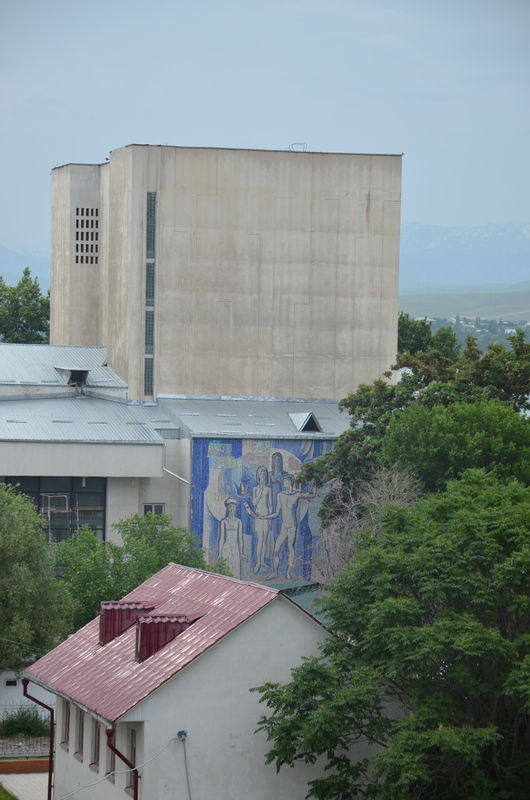 It took us a while to find out we already were in Osh, and only a gigantic Lenin statue finally made us understand the town map in the LP guide. We tried to find the two guest houses we had read about, but no luck. 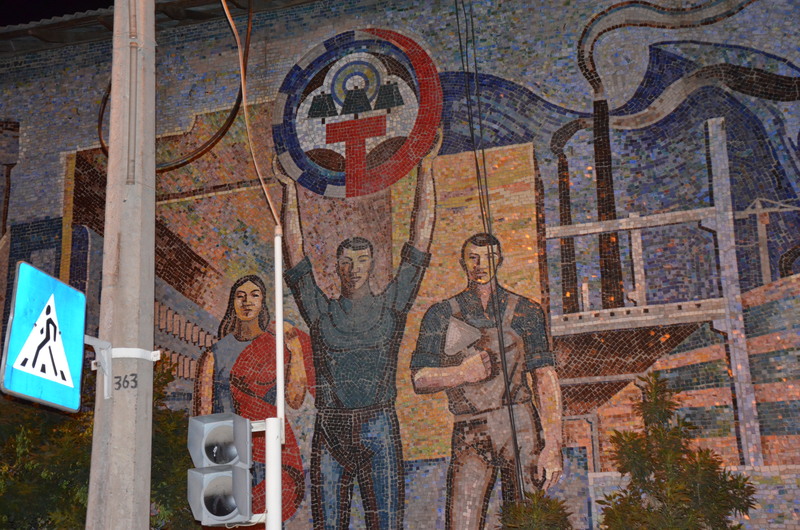 So we decided to pick a big soviet hotel block, the Osh Nuru. The simple rooms at USD 30 are good for the budget. The lobby has decently fast WiFi, the people are friendly. And the room is quite funny actually, decorated with a collage of original soviet furniture, then fixed with patches and new items. 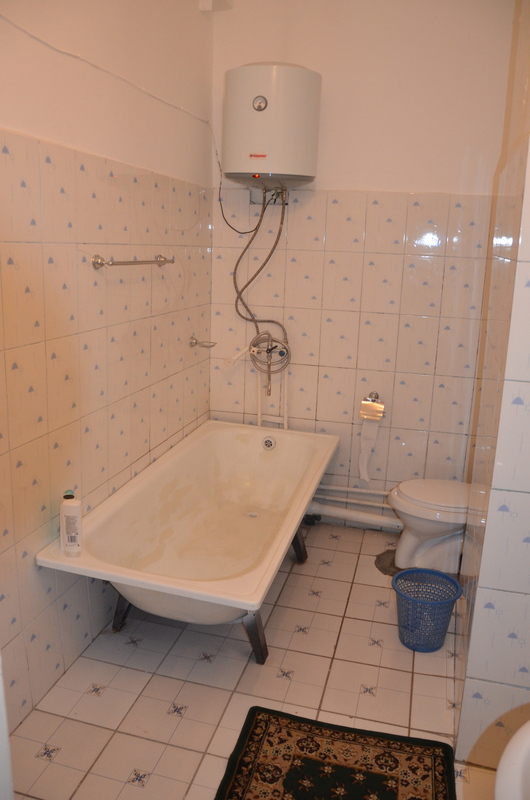 Part of the decoration is missing, things don’t match, the bathroom is an adventure, it smells. But who cares, it’ not as dirty as in Iran, not as desperate as in Turkmenistan. And it’s part of being here. 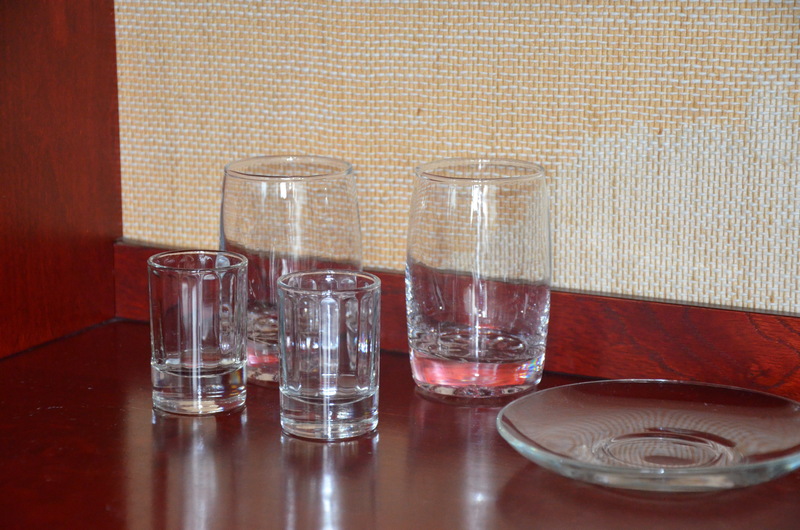 And, they have vodka glasses in the cupboard! We drove into another part of town to find something to eat. At an ATM of Unicredit bank (feels like at home!) we got cash, and then went to a big tea house to eat. The place is completely filthy, the waiters are so too, nobody speaks English, the menu is in Russian. We went with one of the girls to the kitchen counter and checked the dishes that came out, indicating her what we wanted. Our table barely got cleaned, everything is dirty (plates, cutlery, cups), not to speak of the black stuff under the fingernails of the waitress. But the food was ok, different then in the last countries. We had a soup with boiled mutton, that reminded us of Thailand, a goulash and samosas, warm beer and hot green tea. Before driving back to the hotel we bought something sweet in a market next door that felt like a dirty version of a Seven Eleven store without aircon and too much vodka. The chocolate was pretty bad, it probably had melted several times already. Tomorrow we’ll have to check this place further. 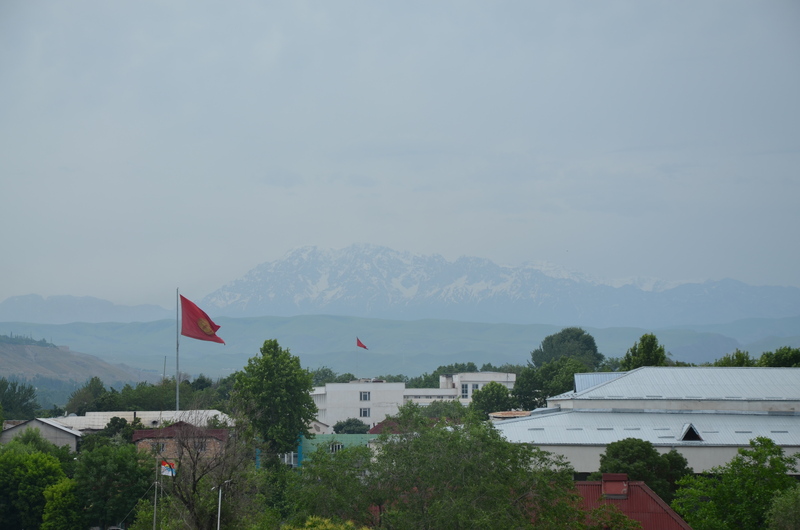 We definitely feel things are getting better in Kyrgyzstan. Crazy drivers, no road signs, confusion, overtake etc these are just demo & rehearsal . I believe you’ll be well prepared (& your tolerance level should be very high while driving 🙂 ) once you’ll entered in south asia, best of luck & tc. Hi! You wouldn’t believe, but it seems I was (on business) in Samarkand and Tashkent exactly the same dates ))) – should have checked out your blog at the time..